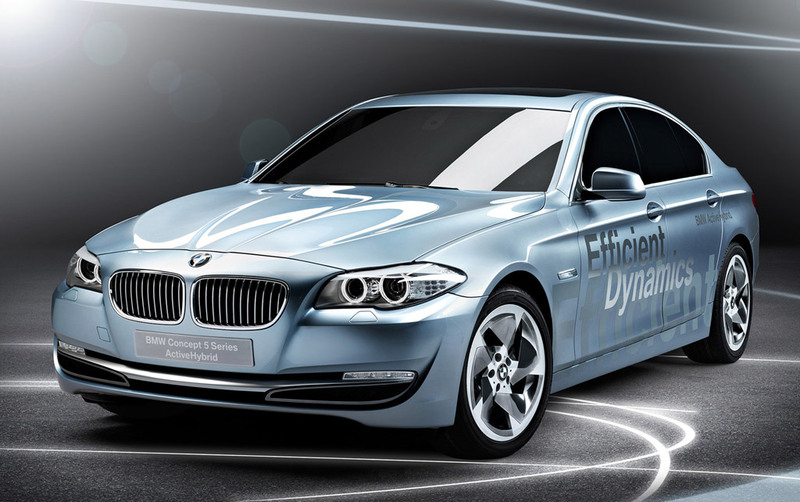 BMW today announced the introduction of its newest hybrid, the BMW ActiveHybrid 5. Based on the BMW 535i Sedan, the ActiveHybrid 5 brings together BMW's 3.0-liter TwinPower Turbo inline six-cylinder engine, an electric drive system and an eight-speed automatic transmission for the first time. 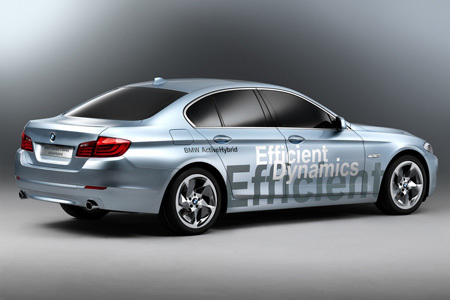 The latest generation of BMW ActiveHybrid technology also adds precisely controlled energy management to the mix. All of which gives the BMW ActiveHybrid 5 an exceptional balance of performance and fuel economy for a benchmark performance/luxury sedan. Its drive system generates combined output of 335 hp (DIN), allows the car to be driven on electric power alone up to 37 mph (60 km/h), and accelerates the BMW ActiveHybrid 5 from 0 to 60 mph in 5.7 seconds (preliminary). The BMW ActiveHybrid 5 will arrive in US showrooms in March 2012. BMW ActiveHybrid 5 boasts not only the sportiest performance in its market segment but also a double-digit percentage improvement in fuel economy over the BMW 535i based on preliminary results. Its full-hybrid drive system enables driving on purely electric power which means emission-free driving in urban conditions. 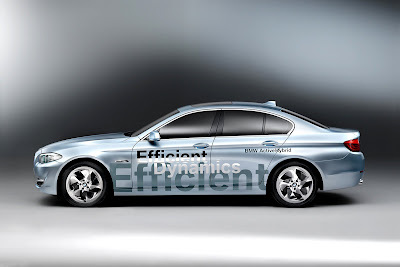 In order to fully exploit the potential of the BMW ActiveHybrid technology, the power electronics in the BMW ActiveHybrid 5 use a host of technologies to ensure the drive system runs at peak efficiency. The high-performance lithium-ion battery is charged when the car is coasting or braking. The electric motor acts as a generator feeding energy into the high-voltage battery. By contrast, under acceleration the electric motor takes on a boost function. Here, it assists the inline six by generating an extra burst of power, lending the sedan's sporty driving character a noticeably sharper edge. The synchronous electric motor of the BMW ActiveHybrid 5 is integrated into the housing of the eight-speed automatic transmission, saving space. The interplay between the electric motor and gearbox is controlled by a clutch. The motor's operating temperature is regulated by the combustion engine's cooling system. The electric drive system develops 55 hp and makes 155 lb-ft of torque available from rest. The motor is supplied with energy by a high-performance lithium-ion battery, specially developed for the BMW ActiveHybrid 5. The high-voltage battery is encased in a special high-strength housing and positioned between the wheel arches in the trunk, providing it with optimum protection. It consists of 96 cells, has its own cooling system and offers usable energy capacity of 675 Wh. The internal combustion engine is only started when the driver requires more power: it is then engaged automatically. The electric motor provides a "boost" function to supplement the engine when accelerating. Maximum combined power is 335 hp (DIN), with maximum torque of 330 lb-ft. Under combined internal combustion/electric power, the BMW ActiveHybrid 5 delivers a 0 to 60 mph in 5.7 seconds (preliminary). The specially designed Hybrid Auto Start-Stop function provides seamless operation when the vehicle is stopped in traffic – after the internal combustion engine is shut-off, the automatic climate control continues to run off the lithium-ion battery. When the driver releases the brake, the vehicle will restart on either the electric motor alone or the electric motor and the inline six, depending on the high-voltage battery's current charge level and on how much power the driver wants. Factors that may cause a change in powertrain operating strategy include the topography of the route and speed limits. For example, if the selected route indicates that a hilly stretch is coming up soon, the BMW ActiveHybrid 5 can invest all the high-voltage battery's electrical energy in providing supplementary driving power for the up-hill without concern about depleting the battery, knowing that the battery will be recharged "at no cost" during the subsequent descent. On longer downhill sections the electric motor's generator function can be enlisted to recharge the high-voltage battery with no loss of speed. The operating strategy can also be managed so as to ensure that the high-voltage battery is as fully charged as possible when nearing the end of the journey, thereby increasing the potential electric driving range in anticipation of lower driving speeds. The operating status of the powertrain components is shown in displays, unique to the ActiveHybrid 5, in the instrument cluster and in the Control Display. As well as the energy flow and energy recuperation display, these include an additional gauge next to the tachometer which shows the boost effect being provided by the electric motor during acceleration. A display in the iDrive interface provides a variety of information – for example on the battery's current charge level and the power-sharing between the internal combustion engine and the electric motor during the course of a journey. The hybrid-specific safety features, which protect the high-voltage lithium-ion battery and the power electronics, are integrated into the BMW 5 Series' existing active and passive safety systems. In a collision, high-strength structural components and large deformation zones help to keep impact forces away from the passenger cell and also from the hybrid drive components. Other standard safety systems on the BMW ActiveHybrid 5 include front and side airbags, side curtain head airbags for front and rear passengers, three-point inertia-reel belts on all seats, belt force limiters and belt latch tensioners on the front seats and ISOFIX child seat attachments in the rear. BMW Assist includes enhanced Automatic Collision Notification. In the event of a collision severe enough to cause an airbag to deploy, eACN immediately calls the emergency call center from the car's embedded phone. It not only transmits the car's location but also an assessment of the risk of severe injury to the people inside, based on a ground-breaking injury assessment algorithm. This assessment is provided to first responders before they even arrive at the scene.